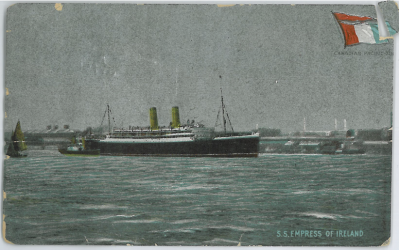 This post card of the Empress of Ireland was posted from Hampton in July 1908. She was one of the great liners of her day, a treasured part of the Canadian Pacific fleet. The horrible fact, about which there can be no dispute, is that the Storstad crashed bow on into the side of the big Canadian liner, striking it on the starboard side about midway of its length. The steel-sheathed bow of the collier cut through the plates and shell of the Empress and penetrated the hull for a distance of about twelve feet, according to the best testimony. The water didn’t flow in. It rushed in. From such stories as could be gathered from survivors and from members of the crew, it appears that Captain Kendall and his officers did all that was humanly possible in the fourteen minutes that the Empress hung on the river. 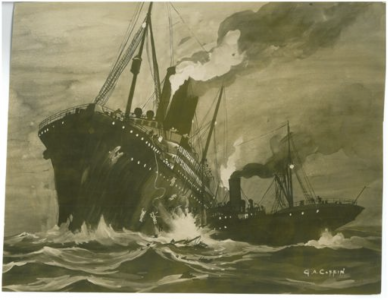 This 8 X 10 glossy, an artist’s depiction of the Storstad ramming the Empress of Ireland, was sent to the press on June 1, 1914. This example was purchased from the archives of the Chicago Sun-Times. Captain Kendall said that he rang to the engine-room for full speed ahead, with the object of trying to run ashore and save the passengers, but almost immediately after the engines stopped and the ship began to list rapidly. The captain of the Storstad declares that it was this action of Captain Kendall that prevented him from holding the bow of the Storstad in the gaping hole it made and that it was the Empress herself, with the way upon her, following the order “Full steam ahead,” which drew away from the Storstad, bending the collier’s bow out of the great gash in the liner’s side, and disappeared in the fog. What further damage may have been done as the vessels parted no one seem to know certainly. Logan Marshall, The Tragic Story of the Empress of Ireland (L.T. Myers, 1914). Early on the foggy morning of May 29, 1914, the Empress of Ireland was steaming down the St. Lawrence near Pointe-au-Pére when she was struck amidships by the Norwegian collier Storstad. She went down almost immediately, taking 1,073 people with her. More passengers were lost than on the Titanic two years earlier–the sinking of the Empress of Ireland was the worst maritime disaster in Canadian history. It was noon on a hot, bright August day. A light breeze, coming up the lake from the west, sent patches of white, fluffy cloud before it, and kicked up saucy, gently curling whitecaps in the main channel beyond the point. Here, on the lee side of the island, the water was still, save for the wake left by a daring bass bug. An old man sat in the partial shade of the boat-house steps and filled his pipe as he watched a small boy playing on the narrow strip of sand in front of him. Suddenly the low, hoarse note of a steamboat whistle came to them across the stillness. There was a slight hesitation in the sound—like the catch in a man’s voice when his throat is dry. The boat was beyond the islands, not yet in sight. “There’s the Islinda” the boy said, looking up from the bridge he was building in the sand. John Craig, By the Sound of Her Whistle (Peter Martin Associates, 1966). I haven’t been very faithful to you, have I? I have to admit that at the start of the year when I began writing this blog, and collecting some of my old archival items for the Solid Gold Box, I was worried about what would happen with it once summer rolled along. Summer can be crazy. I am (happily) deluged with visiting writers and photographers, film and television producers. In winter I am starved for these kindred spirits. And I tend to take on projects. This summer I decided to build myself a new library. We redid everything from top to bottom, trying to stay true to the 1908 original. We built sturdy wooden shelves, comfy reading corners, and a heated slate floor that will make everything snug and cozy during the winter gales. I even gave it a little table that I made from the base of a treadle sewing machine. The library was a lot of work, but it was worth it. We had many other visitors, too. Mrs. Mitchell, whose family owned this house for many years, came to take a look around when she was on a visit to Prince Rupert. I learned quite a lot from her. Most folks say that this house was built in 1913. I knew it was earlier than that—it was already standing during the first fire insurance mapping after the City of Prince Rupert was incorporated in 1910. The way the house sat back on the lot struck me as odd. Especially once I saw the balloon-framing in the back “addition” I suspected that the addition was actually the original, and the house had blossomed out of a squatter’s shack from before the survey. Mrs. Mitchell told me that when they renovated, years ago, they found that the original wallpaper had been laid on top of a layer of 1908 newspapers. For Prince Rupert, that makes this house special. The first surveyors didn’t land here until 1906. This was one of the first houses built. I’ve dated other things about the house the same way. When I ripped out the carpet in Lonnie’s study upstairs I found the hardwood beneath it lovingly protected by a layer of 1954 newspapers. I think that it helps a house become a home when you really understand it, and know its past. But with all this, and keeping up with my regular work, and keeping up with friends through social media, I’ve neglected the blog. I feel badly about that. I enjoy this blog—it’s like the release valve on an old steam engine. I’m always working on some big writing project, and this takes care of all of the thoughts and obsessions and little discoveries that invariably accompany that. I wanted this blog to be a forum about books and writing, about the sea and coastal living. Those are broad subject areas. Writing for a living leads me on a meandering path through all of that. I’d really encourage you to comment, or email me through the contacts page, or get it touch through Twitter or Facebook. Let me know what you find interesting or useful. Because that’s the best part of a blog, isn’t it? For all of the years I’ve published stories, it’s been one-sided. This old hermit is rather enjoying the conversation! With most of this class of men, their “eve of departure” is an occasion of great jollification, and, to use the expression, they arrive at the station “loaded for moose,” and in the right mood to either fight, sing, dance or sleep, just as they may be affected, so that should the one in charge not be a good judge of their different phases of character, and have any doubt as to how to approach them, he will have a most difficult task to undertake; but on the other hand, if he is able to bear with them a little, and to a certain extent humor them in their whims, he will find that they are the best-natured beings alive. E.C. Grant & Alan Sullivan, “In the Lumber Woods,” The Canadian Magazine of Politics, Science, Art & Literature (II:6, April 1894). The Red River of the North has as many windings as a serpent, and its steamboat carries a mate who rarely speaks but he jokes. The last we heard from him was a request to the engineer to burn the crookedest sticks he could find to make the bends with. In these dull days so much genuine wit deserves to go the rounds. Epes Sargent, ed., Arctic Adventure by Sea and Land from the Earliest Date to the Last Expeditions in search of Sir John Franklin (Phillips, Sampson & Company, 1858). I’m thinking about Minnedosa, Manitoba. I grew up there. I wonder if I’ve thought about it enough, over the years. Of course I went back often, when Dad was alive, but then I always moved along and focused on the next story. I had a sense of what was happening there but took that knowledge for granted. Moving with the media to west, then east, then west coasts, my impressions of the old hometown grew quickly muddled—but Dad could always straighten me out when we talked on Sunday. 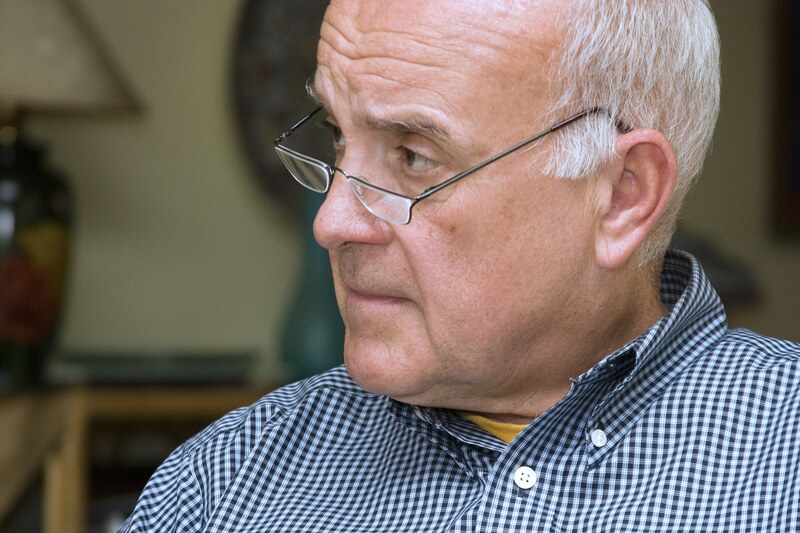 After my dad died I began to think of it less as a place I knew today, and more of an idea. That’s never happened to me before. It’s my job—it’s my life—to imagine places as they are today; whether “today” is a few moments ago or a hundred years ago. Even if the places aren’t real. Yet this idea of Minnedosa had somehow become distant and unreal. It had become a sort of imaginary toolbox, the place where I kept my original knowledge. Memories of growing up there became stories. That wasn’t the case when I was at THIS WEEK about 15 years ago. My old pal Barb Kingdon lived in Prince Rupert at the same time as me in the ‘90s, and gave me an endless supply of hand-me-down copies of the Minnedosa Tribune. 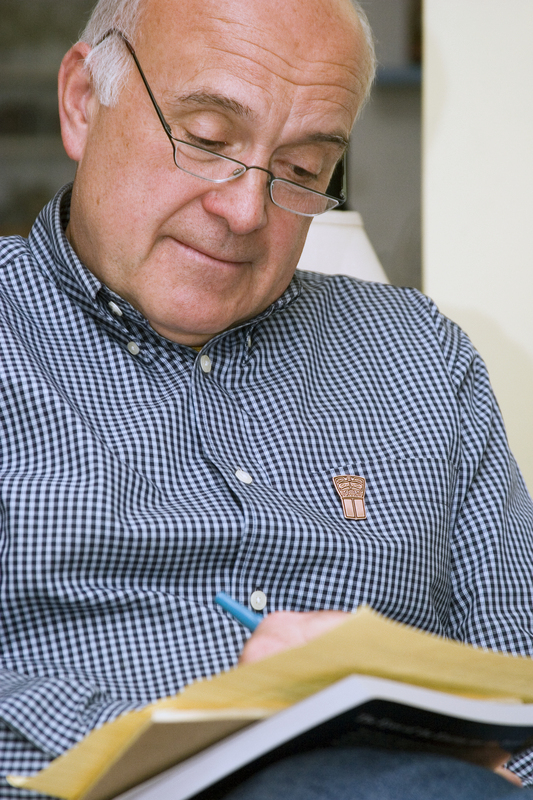 On Sunday my dad could help me sort out what I read. Having Barb there put me back in touch for a little while, and that came out in the columns. I haven’t written anything about Minnedosa in a long while. At least a decade. Then I added Facebook to my social media habits, and reconnected with a few old childhood friends. That’s what made me wonder if I hadn’t thought about Minnedosa enough. Learning the continuing story of old friends, and reviewing old memories, eventually made me paw through the files for various Minnedosa writings—mostly from THIS WEEK—and I’ve gradually posted a few to the Solid Gold Box. These are The Solid Gold Box, Prince Rupert This Week (actually an Iain Lawrence column about reading the Minnedosa Tribune), A Gift From W.O. Mitchell, and The Town Constable. The reason that I (finally) accepted Facebook was that it allowed me to stay in touch with old friends. I’ve accepted other forms of social media for different reasons than that—but Facebook offers an extension of friendship, and thus a re-visitation of self. Sorry. Not “Facebook.” “fb” (lol) cu L8r. I’ve talked about Walter Smith’s accomplishments in tourism many times, in print and at public events, beginning back when Tourism Prince Rupert created the Walter Smith Visionary Award in 2007. I will continue to speak about him each year that I present the Walter Smith Visionary Award. What he did for tourism, for this community, and for northern BC, over what was ultimately a 74-year part of his 94-year life, defies belief. He was recognized for it. Because Prince Rupert always came first for Walter, being awarded the Freedom of the City was certainly his proudest moment – but that was just one of several impressive recognitions stretching all the way up to the Canadian Tourism Hall of Fame. I tend to focus, naturally, on his involvement in tourism – but Walter was multi-faceted. It’s hard to keep track of it all. Something else occurs to me and I think, “Oh, yeah, he did that, too.” Big things. Such as when, during the service at Annunciation, I was reminded of his deep, lifelong devotion to his church community. 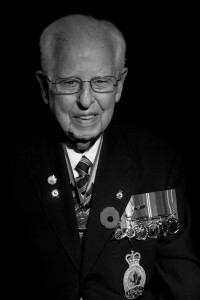 Or, as Peter Witherly played the Last Post, how I powerfully felt the significance of this veteran who served from before the beginning until after the end of the Second World War. For a Canadian of my generation, one of the sons and daughters of the veterans, that tugs at emotion lying at the very core of my being. Walter was selfless when it came to promoting Prince Rupert and the north. He was never in it for himself. Tourists don’t tend to flock to mens’ wear stores. Walter just believed that tourism was good for Prince Rupert, and it fit naturally with his larger-than-life pride in this community. He threw himself into any opportunity to build Prince Rupert’s reputation, whether it was a big, important initiative or a tiny moment of kindness that would pass unnoticed by any but the recipient. Fifty years ago he and Polly Sergeant drove through the creation of ‘Ksan Historical Village, showing that they understood the future of BC’s competitive advantage in promoting aboriginal tourism. Or he simply intercepted some stranger, in some far-flung corner of the world, giving a polite Canadian hello and presenting them with one of his mysteriously endless supply of Prince Rupert pins. During the war he was a Navy communications officer. For the rest of his life he was our communications officer. Whether it was a big thing or a small thing, Walter’s approach was damned effective. And damned simple. He liked people, and people liked him. He was fun to be around, and he made you laugh. That transcends most human barriers. It was just as effective on the provincial Minister of Highways as it was on the cruise ship passenger stepping off the ship to spend a few hours exploring Prince Rupert. That’s the thing about him. And he had a way of cheerfully pouring his soul into projects he believed in, no matter how small they might seem to others, and doggedly pursued his goals with astonishing energy. And he was so very important, in so many ways, but he was never self-important. Cheers, Walter. I miss you already. But wherever you are now, I’m pretty sure you’ve already gotten more than a few good laughs. On a Friday at the beginning of July Black Press announced their purchase of the Prince Rupert Daily News. On the following Monday they announced that they would retire its century-old masthead. Black Press owns the competing weekly, so it was a convenient execution. There’s a lesson in this, but not the one you might expect. Although I published and edited a sister paper during the era of Hollinger ownership, and was involved in some of the decision-making in the mid-‘90s, I never worked at the Daily News. I’ve watched most of this from the sidelines—watched increasingly junior staff make frustratingly basic mistakes, watched the ad count decay. I’m saddened by the death of any newspaper, more so because this was my hometown daily. But even given my limited involvement I’ve known for 15 years that, unless there were some drastic changes in approach, the death of the Daily News was only a matter of time. Compounded bad policy hastened that end. Was the Daily News another victim of economics, and of changing taste and habit as newspaper readership turns increasingly to online new sources? That wasn’t the case here. Not even close. Here a newspaper’s distant ownership allowed increasingly bizarre local decisions that hurried along the paper’s death. Tiny papers such as this one can still be resilient to the trends that are collapsing the big dailies—they can be lifelines for small communities if they adapt and stay relevant by telling community stories available nowhere else. Readers will continue to turn to any information source that is meaningful to them. The Daily News was unable to adapt and unable to stay relevant. Instead, this story is a lesson in what happens when a newspaper—or any news source—allows itself to stop mattering to its audience, and therefore its advertisers. In the mid-‘90s the media climate in the north remained viable for an old-fashioned approach to news reporting. The local TV and radio stations, with a staff of real local announcers and newsies, were powerful sales forces. Hollinger published the daily and the weekly, both with staffs larger than comparable papers, and the market even supported a variety of other products—independent tourism guides, a weekly TV listing magazine, and so on. But the writing was on the wall. The city’s largest employer was entering death throes, which brought a tightening of local advertising budgets. At the Hollinger papers we were saddled with bloated payrolls and an outdated, expensive press at the Daily News. Our weekly property had issues; for one, when I took it over in the mid-‘90s, despite a powerful editorial and graphic reputation it was already desperately in the red. At about the same time Pete Godfrey became publisher of the Daily News. He and I talked for hundreds of hours, trying to devise a solution to all of this. The most obvious was the path taken by Black Press. We had reached a sort of détente with Black Press. Hollinger (here Sterling Newspapers) and Black Press had carved up the newspaper communities of the north between them, the publishers suspiciously eyeing each other like the lords of medieval walled cities. They had a powerful advantage over us. Black Press had amalgamated their printing at Williams Lake. That made one press profitable, and, without expensive pressrooms, made the remaining papers all but recession-proof. Papers like the Daily News had been in Hollinger control since the early ‘70s, and hadn’t exactly seen progressive change. Our press was a relic of that era. In fact, if there was a business plan at all in Prince Rupert it wasn’t one that made sense to me (when I started we even owned a hotel here, something that I doubt even the cleverest newspaperman could properly understand—let alone run profitably). Yet just down the road we owned the Prince George Citizen. That was a former Southam paper, a Cadillac by comparison, and with its comparatively modern press we could surely bolster long-term viability for all of us by printing our northern papers there. We didn’t get far with that idea. We fell back on local solutions. Why not take the Daily News to a tri-weekly, reducing our print costs and forcing our remaining ad revenue into three editions per week? Why not consolidate our forces, incorporating the weekly into the daily in a strategic fashion before we were cornered into closing one? Nor did we get anywhere with these ideas. I was never directly told so, but I had the impression that the borrowing power provided by equity in these bloated papers was more important to the ownership than their future viability. That’s not the sort of position that would be adopted by local ownership, but it was hardly a surprising position in that corporate climate. The pulp mill closed. Within two years we closed the weekly. It would be an oversimplification to say that the declining advertising revenue couldn’t support a unionized shop, but that was at the core of it. We’d brought it back out of the red, renewed the community’s interest in it, but with the closure of the pulp mill it slipped back out of the black. We might have hung on for awhile, but when the collective agreement expired, and there was a demand for increased wages to achieve parity with the Daily News shop, there were no options left. As predicted, that further complicated matters at the Daily. Printing the weekly paper had been one of the long-term revenue streams that could be counted upon to keep the Daily profitable. Local businessmen who understood the newspaper business also saw the writing on the wall. When we announced the closure of the weekly, Mitch Greene, as a representative of the same local group that had sold the Daily News to Hollinger, engaged me to buy it back and make it work as a local paper. Hollinger wasn’t selling. That’s really too bad, because when the paper did ultimately sell, in the spectacular collapse of the Conrad Black empire, to CanWest and then Glacier, daily decision making removed it further and further from relevance within the community. Sure, advertising revenues were in steep decline. But there was still enough advertising to create and sustain a competing paper. There was still a local need for advertising. But without the core issues of profitability addressed, what followed was inevitable. Somehow, as a tiny player straggling along behind a corporate pack, even the basic principles of newspapering were gradually forgotten. I can think of a dozen bad decisions that even a casual observer must have wondered about. At one point they even moved their prod department out of shop—out of town altogether, in fact. Anyone who has even witnessed the mad bustle of deadline knows that can’t work. Satisfied advertisers need the last-minute ability to make changes and proof. Without that the advertising base will slip further, and the end-of-month spreadsheet will look even more grim. To retain the flyer business that had sustained This Week, when the weekly closed the Daily had created a weekend TMC (an inexpensive, total-market circulation “flyer wrapper”). For whatever reason it wasn’t working. Perhaps it proved unprofitable in the face of a lean, new independent weekly. Instead of forcing at least a portion of that business into the paid circulation days—or simply allowing the competition to take business that was for them unprofitable—the Daily made the insane decision to distribute two of their paid days free to the total-market. Besides an increase in printing and distribution costs, that instantly devalued their subscription base. And after awhile it seemed as if the circulation department stopped even trying to ensure consistent delivery—at my house I would see maybe one of their free editions every few months. Things were just as troubling on the editorial side. Even in the ‘90s there was an unfortunate reluctance to end the practise of using wire stories as fill, even though broadcast had long since ended their relevance. That they remained, relics of a time when print was the sole news source, fostered a feeling among readers that the Daily News was losing its relevance. The same space could have been much more effectively filled with columnists from community groups, photo features, and other low-effort forms of local content. It seemed as if the editorial decision-makers knew that they needed to engage their readership, but not understand how to do it. I don’t believe that the resulting mess was always a result of intentional policy. Sometimes it was simply a case of reporters being allowed to run amok. I recall a reporter of maybe seven years ago who skated at the edge of libel with his conspiratorial, tabloid-like partisanship. Or a pair of more recent vintage: Their specialty, presumably to stretch their quotas, was running one side of a story one day, and the other side of it the next, apparently revelling in the contention caused by unbalanced reporting. Perhaps this was just laziness; they were so adept at ignoring the community that the joke around town was that if it didn’t happen within sight of the Daily News building, it wasn’t news. It was good for people with a specific message to convey—craft a press release, and these wunderkinds would legitimize it by running it verbatim under their own byline. But journalistic integrity had become a forgotten virtue. None of these cheap tactics sold newspapers. Instead they further alienated readers. And realizing that they had further alienated their readers the Daily flipped to a saccharine approach to news that would gag any seasoned editor. These bad policies, coupled with the memory of bad reporting, overshadowed the good, hard work done by the reporters on a day-to-day basis. And there’s good work being done. Heck, just the guy covering the local sports beat right now is as good as any I’ve seen anywhere. Anybody with real newspaper experience would have understood all along that sales and profitability rest on the twin pillars of solid content and circulation. Reporters tirelessly work their beat, truly keeping their fingers on the pulse of the community, always digging deeper, and reporting on it in a balanced and compassionate fashion. That keeps readers engaged. As long as the reporters hold onto that pulse, and the paper reaches those readers, it will remain relevant. No offense to the very hard working individuals who have manned this rudderless ship—I’m sure that most have seen these things for themselves—but none of this has happened at the Daily News for many years. And that’s what makes this closure so bloody sad. It was completely, indisputably avoidable—a needless death. A drifting ship finds shoals. Iain Lawrence wrote a final installment of his popular column “Across the Harbour” for the February 7, 1999 edition of This Week. He had been reporter and then editor at the Daily News, back in the ‘80s. In his final column he wrote about how the Daily News was always the survivor of Prince Rupert’s surprisingly complex newspaper history. He wrote about how the Optimist became the Daily News, how the Evening Empire eventually lost out to the Daily. He remembered the opening days of This Week. “It was like a bunker in there,” he wrote, “with the Daily News camped outside with endless supplies of money.” And now, he wrote, the bound volumes of This Week were trundled up the hill to the archives of the Daily News, as had been the case with every single one of the many newspapers that had gone before. This trend is ended. That stalwart, the undefeatable Daily News, has been defeated. And like so many unassailable bastions, in the end it did not fall to an enemy. It didn’t lose its readership to the Internet. Despite the crowing of online pundits, I doubt that the Internet had any meaningful impact whatsoever upon its readership. No competitor made the Daily News lose relevance. It was the paper’s own policies that did that. Iain’s assessment should have held true. They should have been the last. It’s ironic that, after winning so many newspaper wars, the Daily News fell in this way. No competitor ever beat it. No competitor ever won a newspaper war against the Prince Rupert Daily News, but that didn’t stop the Daily News from losing one. Out into the river proper the little boat chugged—into a land of terraced valleys, sleeping glaciers, and high clay banks pocked by swallows’ nests and bright with brier rose and bluebell. Here was an empty domain of legend and mystery. In London, globes of the world were still being issued showing the Yukon River flowing north into the Arctic Ocean instead of west into the Bering Sea. And there were stories told—and believed—of prehistoric mammoths that roamed the hills with jets of live steam issuing from their nostrils, and of immense bears that prowled the mountain peaks in endless circles because their limbs were longer on one side than on the other. Pierre Berton, Klondike (McClelland & Stewart, 1958; revised edition, 1972). I’ve been rather quiet online lately. I’m shocked to realize that it’s been over a month since my last posting. A lifetime spent writing has made me very effective at what the psychiatrists call compartmentalization. I can ignore a hundred looming tasks and crises while I focus on one project. That might make it possible for me to simultaneously work in diverse areas, but once in awhile I’m sucked in by the project and it’s all I can do to focus on that as well as my regular work. One of these times is when I’m plotting a new story. When all of the elements of a story are swirling about, and I’m trying to catch the dangling threads and weave them together, it doesn’t leave much brain space. I don’t even read things that I would normally consider reading. 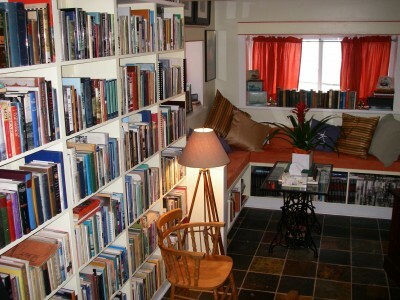 None of my reading is for pleasure; I don’t even glance at the fiction reading pile. Lately it’s been in-depth histories of the 1890s and ethnographical studies of a particular aboriginal group. Seriously. I’ve been lying awake at night, utterly absorbed in books with chapter titles like, “Traditional Conservation and Harvesting Strategies.” If I did stop to write a blog entry, it wouldn’t be something that many people wanted to see. I think I’m over it now. I have a neat outline—perhaps not finished, but at least to the tinkering stage—and I have my life back. Now, what were we talking about? I hope that fear-driven uncertainty about the future of publishing doesn’t distract us from the simple truth that we are trying to bring our stories to readers. In a candid conversation last week, a travel writer of considerable talent and experience told me that he may opt out of travel writing in a digital age. Perhaps this was tongue-in-cheek, but I could hear in his tone that it was something he’d seriously considered. The battle for publication takes a lot out of a writer. For the novice, publication is the finish line in a grueling marathon. The prospect of having to fight the battle again and again, the rules changing with each contest, is disheartening to say the least. A fickle readership with limited leisure time faces an escalating amount of information. Where will we even find a loyal readership? How can the writer make a living in a world where consumers are conditioned to enjoying an unlimited wealth of free content? It’s not that my friend didn’t understand new media, or that he wasn’t active in it. Yet he was questioning whether or not he still had the ambition to start over in a new and sometimes bewildering world. I hope that he comes to his senses. Because what’s lost in all of this discussion of e-business and online editorial content and social media is that at the heart of it the reader’s hunger for the storyteller remains the same. In this type of writing, travel writing, as in many others, there are up-and-comers showing spectacular results. But in their fascination with the new and shiny I fear that some may be missing the point. We’ve all heard the stories of the driver who plowed into an eight-foot bridge with a ten-foot truck, or tried to drive over a washed out bridge, because he couldn’t take his eyes off the miraculous technology of his new GPS. We hear this and shake our heads – could he not lift his eyes long enough to see the red warning sign? But I think that this approach to the allure of technology might be more common than we imagine. Technology helps, but it can’t replace vision and common sense. I know a travel writer who has mastered blogging and social media. Thousands follow his whirlwind assault upon the world. They live vicariously through his endless adventures. It seems that he tweets from Indonesia today and Scotland tomorrow. Yet his success relies on a cult of personality. What does he actually see? When he visits my city, what impression might he leave with the potential visitor? I suspect that the answer to that question is very little. He’s mastered the romantic allure of the journey, but offers nothing more substantial than that. I would say the same of traveler’s blogs. These are diaries, home movies. Here we have detail – too much, in fact – but not the kernel of truth provided with seeming ease by the veteran observer and storyteller. The experienced travel writer can visit the most mundane destination, truly see it, and describe it in a fashion that makes me want to go. Online glitter can’t replace that. To Marco Polo, painstakingly scratching out his observations with quill on vellum, even the earliest printing press might have seemed to be an abomination of the devil. But the medium is not always relevant. The medium here is not the message. The message remains firmly in the control of the storyteller. The veteran storyteller, who studies trees without being distracted by the immensity of the forest, can master this beast. Each year I attend an event known as Canada’s Media Marketplace, where those of us who promote Canadian destinations meet with some of the best travel writers in the United States. Because I work with travel writers—and have even been one—I am often asked about the life. To the uninitiated travel writing seems so simple—writing a story pays for a trip. A few publications do indeed send out staff writers and photographers strictly on their own budget. That is increasingly rare. Usually the destination, seeking publicity, assists with the costs through a complex network of partnerships. For travel writer, publication, and even the destination, establishing impartiality despite this contribution is paramount. Rather than try to describe the life from the travel writer’s perspective, I’ll turn over the mic to my friend Steve Lorton. Steve was employed by Sunset Magazine for almost 35 years, retiring as Northwest Bureau Chief in 2005. I first met Steve in Los Angeles six years ago, and have worked with him on three visits to Northwestern BC. He is, if you will forgive the cliché, the consummate professional. Polite and affable in his approach, patient with the inevitable glitches of frequent travel, and keenly interested in everything he encounters, Steve set my personal standard for the very best in travel writers and travel writing. Bruce: What led you to this wonderful life? Steve: Back in Ohio, I grew up in a family of storytellers. The family was large and extended and full of people who had lived a very long time. I was the only child of my parents. Aunts and uncles who had retired lived with us off and on. Aunt Lee was with us often for long periods. She had been born in 1859 and she lived to be a rip-snorting 98 ½. She died shortly after I turned ten. I spent a lot of time with her. As a child she remembered being in her father’s arms and seeing slaves auctioned off in Memphis. I think she sowed the seeds of journalism in me. It was an amazing collection of people in our big, old drafty house. Everyone was opinionated. Everyone had been somewhere, done something. And equally important, I grew up in a family of listeners. Everyone was truly interested in what everyone else had to say and then commented on it, hashed it over, got back to the source to hear more or understand better. Ours was pretty much an oral tradition. I remember when we got our first TV when I was 7. I found it pretty much boring. I wanted to be sitting at the dinner table, long after dessert was served, listening to everyone talk. Because I’d heard so much from so many sources in so many styles and voices, I wrote my first piece in the sixth grade. Suddenly I was the editor of our class newspaper. Then my mother caught on. She was busy. “I’ve got to write Aunt Thelma [living in Arizona]. You write so well. Write a letter for me and read it to me. Then we’ll send it. Tell her all about what we’ve been doing.” Suddenly I was family field reporter and scribe. I wrote several letters a week, sent all over America and to far away countries. Two things had happened, I was imprinted with the idea that I wanted to get out and do the exciting things my relatives talked about having done and, I wanted to write about them. Undergraduate school followed: a degree in communications. Then, after two years in Asia with Uncle Sam, graduate school: a degree in journalism. I walked into the offices of Sunset Magazine in Menlo Park, California (a suburb of San Francisco), and walked out with a job. It was a simple as that. And what a career! In 1990 the magazine was sold to Time/Warner and for the next fifteen years my life got only more far flung and exotic. I’m retired now, but I’m still writing and I can’t imagine a more fulfilling or exciting life. I was just plain lucky. Bruce: Is there any way for you to give us a sense of the highlights? Steve: I could sit here and tell stories for weeks. There were huge adventures, things most people only dream about or see in movies. Rosemary Verey (the maven of British gardening) took me to Highgrove to meet Prince Charles. We strolled around his private garden and he was engaging, charming, a complete delight. I met the Queen twice. There were others, many of them: John Kennedy, Jr., Mae West, George Bush Senior, Roberto Burle Marx, Princess Pilolevu of Tonga, and governors of all the Western States. I once sat a dinner between Kim Campbell and Ian Tyson, Truman Capote, Anderson Cooper, and his mother Gloria Vanderbilt. On and on. There were hundreds of famous people. There was samba atop Sugar Loaf in Rio de Janeiro, jumping off a tramp steamer and swimming ashore to a remote island in the Fijian archipelago to spend a day with the descendents of cannibals. The supply boat picked me up late that evening as they headed back to Lautoka. James A. Mitchener never had a more exciting time. I can remember singing a Korean folk song with nuns in one of the gift shops of the Vatican, singing the same song in a Korean restaurant in Saint Petersburg, Russia, and again on the long, high and scary cable car to the top of the Yellow Mountains in China. The car was filled with Koreans who had been into the mokolay and were feeling quite merry. As we sang they decided to make the car swing on the cable. Respectful folk that they are, they stopped when they heard and saw the panic in me. It goes on… and on and on and on. But that having been said (and I know how corny this is going to sound), those were not the highlights. It was always the people and the quiet moments where I felt insignificant in the midst of a world so immense and vast that it truly made me see that I was a small, insignificant part of a great whole. It was riveting. I thought about that and quoted him a thousand times. Truly, I felt like I’d heard the voice of God. There were children in the favelas of Rio de Janeiro who screamed with delight at the gift of a bottle of bubble blowing solution. I remember the postal worker in Finland to whom I commented that under their circumspect demeanor the Finns were very warm loving people. She stared back at me, poker-faced and said, “Here we think that as you shout to the forest, it will echo.” Then she touched my hand. I left without another word. There was a Chinese man who held my arm and helped me down the steps from the Great Wall. “Oh,” he said. “I would not want my grandfather to fall. I do not want you to fall.” I didn’t think I looked that old! But I cherish the moment. There was the family in British Columbia who invited me into their home, served me dinner, had their toddler daughter do a little performance for me, and put together a box of gifts to take home to my wife. Truly, in an evening my heart was altered. What do you say to that? What do you do? Thank whatever spirits out there for giving it to you, I suppose. That’s it! That’s what I’ll remember. That’s what will flash before me when I close my eyes for the last time… hoping to come back and do it all again. On my first trip across the Pacific in 1968, I was reading a newspaper. A tiny item on the bottom left hand corner of the front page caught my eye. It was a regular feature: Thought for the Day. It said, “All people smile in the same language.” And that is so simply and perfectly true. Once I interviewed the American playwright Edward Albee. He was unexpectedly charming and warm. Of theater and the impact of plays he said, “Every time I leave the theater, I would hope that I am somehow a different person.” And I hope that every time I come home from a trip I am a different person: stronger, wiser, happier, more grateful, more deeply in love with life and this world. Bruce: There must be a downside to this. Steve: Not really. Mind you, I had a very supportive wife and family. My wife never complained, even when I was gone for long stretches (should I be worried about that?). And, for the most part, I always got back for the soccer games and class plays. Once, in Atlanta, I walked out of my hotel room and onto the street after a long series of cities and I thought, “Where am I?” When that happened, I announced to corporate, that I’d not travel more than two weeks a month and that I expected to be home on weekends. There were no arguments and, only a few exceptions. Bottom line, I’ve been deliriously happy all my life. To quote an American Southernism: I landed in a tub of butter. Bruce: Where do you think that the future will take travel writing? How much of a future do you see for travel writers in print? Steve: The future? Travel writing and tourism has been going on a long time. I remember reading as I walked through the King Tut exhibit that by the time Tut came along, the pyramids were only visited by strange funerary cults. They were antiquities to those people. Wow! In Tut’s time, ancient Egyptian tourist went out to see the faraway, old and crumbling, pyramids. People have always traveled. That won’t change. And, in the media, we’ll continue to report our trips our discoveries, our feelings. So I believe that two truths emerge from this, pitted against modern times and the proliferation of media. If you go, if you encourage your readers to repeat your experience, you are not involved in Objective or Impartial Journalism. If you write about it, you either want people to go or you want people not to go. So the writer’s opinion, sentimental as it may be (and mine always was), needs to come out, full steam. You cannot lie. You cannot spin. You must tell the truth. But tell your truth. That’s what people want to know. I remember when a young travel writer came into my office in the 1970s and wanted to freelance travel stories on Europe. The guy bristled with energy. Sadly, I couldn’t assign him anything. We only did one foreign travel story per issue and those were covered by staffers who had gone on press trips. But I remember that young guy, vividly, for his love of travel, his enthusiasm and the integrity that poured out of him. That was Rick Steves. Rick tells the truth… his truth. 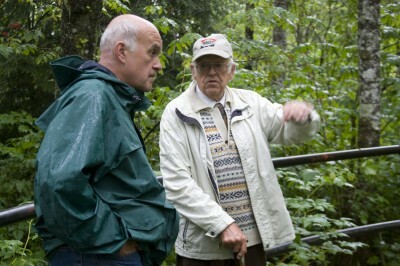 Steve with Second World War veteran David Hill at one of the abandoned artillery forts on Kaien Island. A few years ago it so happened that my work—teaching school—kept me during the week in a small country town in the centre of one of the prairie provinces while my family—wife and little daughter—lived in the southern fringe of the great northern timber expanse, not very far from the western shore of a great lake. My wife—like the plucky little woman she is—in order to round off my far-from-imperial income had made up her mind to look after a rural school that boasted of something like a residence. I procured a buggy and horse and went “home” on Fridays, after school was over, to return to my town on Sunday evening—covering thus, while the season was clement and allowed straight cross-country driving, coming and going, a distance of sixty-eight miles. Beginning with the second week of January this distance was raised to ninety miles because, as my more patient readers will see, the straight cross-country roads became impassable through snow. These drives, the fastest of which was made in somewhat over four hours and the longest of which took me nearly eleven—the rest of them averaging pretty well up between the two extremes—soon became what made my life worth living. I am naturally an outdoor creature—I have lived for several years “on the tramp”—I love Nature more than Man—I take to horses—horses take to me—so how could it have been otherwise? Add to this that for various reasons my work just then was not of the most pleasant kind—I disliked the town, the town disliked me, the school board was sluggish and unprogressive, there was friction in the staff—and who can wonder that on Fridays, at four o’clock, a real holiday started for me: two days ahead with wife and child, and going and coming—the drive.